So much for the market’s faith in the latest Eurozone rescue plan. Investors initially cheered last Friday’s agreement by European leaders to establish a banking union and to funnel aid money directly to troubled banks. The deal stoked optimism that Italy and Spain could steer clear of requiring sovereign bailouts like the ones needed by Greece, Ireland and Portugal. That relief was reflected by lower yields on Italian and Spanish bonds. But the optimism – and the lower yields – have not lasted. 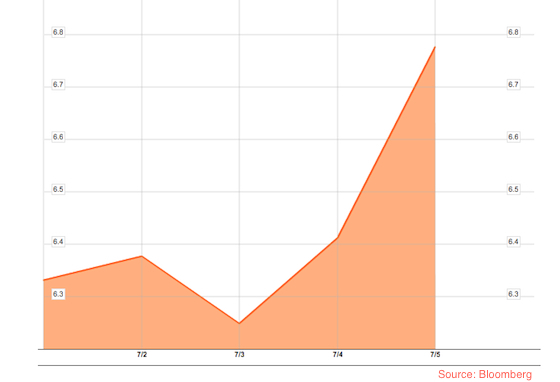 The rate on Italian 10-year bonds is back above 6 percent, while the yield on Spanish 10-year bonds, seen in the Bloomberg chart below, have been creeping higher and today spiked back above the troubling 7 percent mark before settling at 6.95 percent. That is still above last Thursday’s close. Time for another summit?